However, the difficult thing about green is that the shade has to be bang on. It can’t be too strong a colour in its own right – it has to be either fairly muted and pale (like my Reillo cotton suit) or dark and deep, like the flannel pictured here. Several readers had asked for pictures of this suit, going back to my post ‘Green is the third colour’ two years ago. My apologies for not doing it sooner. It was made in a particularly nice vintage Fox Flannel that I picked out while visiting the factory back in 2011. Unfortunately, it is no longer available. Not because Fox cannot weave it, but because the colour is not offered by the yarn supplier. This fairly deep green sits well with a burnt orange wool tie, a mid-blue shirt and a silk handkerchief with green shoestring (the rolled edge). 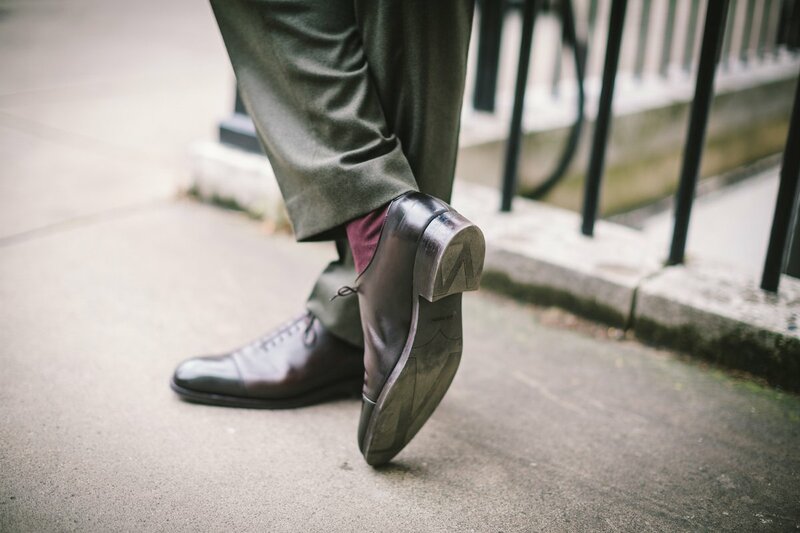 On my feet are JM Weston dark-brown cap toes, which have a thin rubber sole and are my go-to shoe for wet weather. The upper has also been patinated, which helps with water resistance (in the same way as several layers of polish do). The burgundy socks from Bresciani demonstrate another good colour with this green, though that shade wouldn’t work quite as well as a tie or handkerchief. The suit was made by Brian Smith, an Anderson and Sheppard-trained tailor who works out of the Fox Flannel factory and makes suits for Fox’s ever-dapper salesman, Douglas Cordeaux. It is a drape cut, as you would expect, with soft extended shoulders, a small armhole and generous sleeve. Brian also cuts quite a high, sharp gorge. The fit, however, isn’t perfect – I’ve been meaning to take it back to Brian or another tailor in London for a while. The shoulders are a little low, leading to a slight collapsing under the arms, and the seat isn’t quite right. There are also one or two points where the workmanship could be better. The pale-green thread is showing through in one or two places around the patch pockets, as you can see below. Having said that, Brian is good value (see full prices below) and does all the tailoring himself. He also visits London every week or two, so there’s no need to go down to Somerset for every fitting. I’m sure working consistently with him on a pattern – as Douglas has done – would lead to some great suits. You can follow the discussion on Green flannel suit – from Brian Smith by entering your email address in the box below. You will then receive an email every time a new comment is added. These will also contain a link to a page where you can stop the alerts, and remove all of your related data from the site. And in tweed, of course. Favorite of the American professorial class, paired with tattersall shirt and knitted tie. Hi Simon, nice photos! Nice shade of green too. I’m also following your recommendation and making a pair of dark green cotton trousers. Just wondering whether you find your trousers a bit too long and too wide below the knee? I guess sliming and shortening them (tapered) will make your neat. Is that some visual effect you are trying to experiment or you just prefer such silhouette? Perhaps a little wide, yes, though not too long. It is quite lightweight flannel (9/10 oz I think) so it doesn’t hold a crease that well. Personally, I think a classic or slightly wider leg looks best on Simon due to his age, height and his style of dress. Narrow trousers lack any sense of drape in the cloth. Flannel’s beauty comes from its texture and lovely drape (9-10oz is light though). That’s fantastic! I feel like I’m slowly starting to be able to “see” the effects of different cuts (thanks in no small measure to your blog), and this suit is right up my alley! Simon – I greatly appreciate a flannel suit. You’ve already pointed out some of the tailoring issues with this suit, but I’d also suggest that you taper the sleeves (a touch), and the pants (same). I don’t like a tightly cut suit – I think a natural one works best, but tailoring is a game of millimeters, not inches. I’m curious, Simon, about something. You seem to be a connoisseur of bespoke, yet I’ve read a good many of your posts that are less than positive reviews of these suit and shirt-makers. Case in point – this post on Brian Smith. While I’m not interested (at this point) in going bespoke (I’ve found the ultimate off the peg maker for myself), I wouldn’t use Brian’s services based on your post alone. I’d rather spend 30% more (for example) and get someone whose work I don’t have to significantly tinker with. You often post about makers whose work is good, but with serious reservations (trouser makers, shirt makers, et al). My hallucination would be that – by this stage – you’d be better at sussing out who’s worth your pounds sterling, and who’s not. I know you need to generate content for your blog (thus the commissions from these far-flung gents), but that’s a pricey proposition (unless this blog has more than offset your travel, dining, cloth and labor prices). If this is true – do you need an assistant? I love the turnback cuffs! Is it possible to add these on to an RTW suit, or are they cut as part of the sleeve? Simon, I’m glad that you’ve discovered Bresciani socks! I’ve always been very impressed with the Bresciani workmanship,yarn quality and superb designs. I have that same sock you have on in the photo or something very similar. I’ve found that the Bresciani sock holds it shape extremely well over time and shrinks less than the other top end companies that i’ve used. The company’s quality control and consistency that you mentioned is fantastic. I have on a solid mid blue pair from the Fall line that is simple, but gorgeous. Simple pleasures! In spite of the minor flaws Simon mentions, this is one of the nicest suits I’ve seen on this blog. The drape cut creates a slim, athletic silhouette without any conspicuous padding in the shoulders. The length of the jacket is perfect, and I love the rust-colored tie. I find the turnback cuffs superfluous, but obviously that’s a matter of personal taste. The only problem i have with sourcing socks from Bresciani is finding a supplier that holds a large range. Yes there are suppliers that offer the bog-standard colours but, when you look at the Bresiciani web site you realise just how many types/colours they do produce. Writing to them yielded nothing as the supplier they offered in London stocked just a few pairs! Pity no-one picks up on this as i agree with you, their socks are unrivaled and very well priced. I think jacket cuffs should be restricted to the most formal of riggs. And, Simon, are the shoes whole cuts as you say, or cap toed? Weston shoes are wonderful and to some extent underappreciated. Glad to see you wearing them. Simon, Bradley mentioned the difficulty of finding a Bresciani stockist that carries a large selection. I’ve had the same problem also. Do you know of a stockist in the United States that carries a wide range of Breciani socks? Turn-back cuffs are neither formal nor informal. 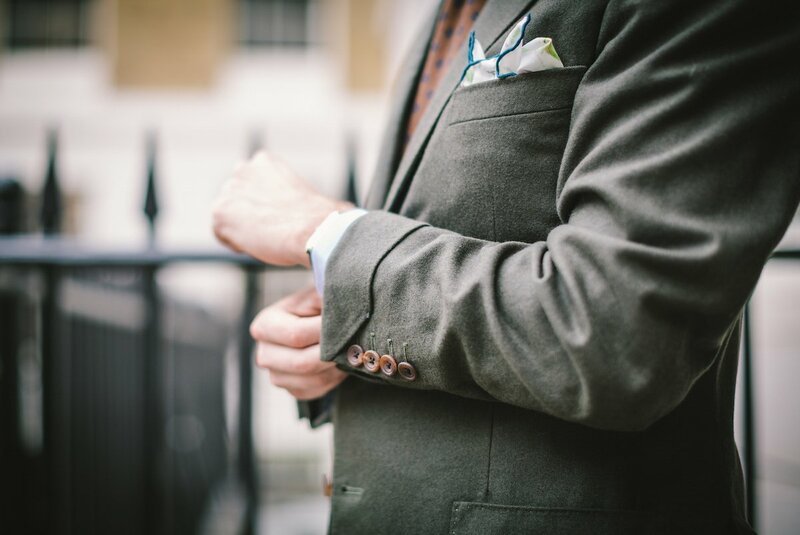 They’ve been around a long time and are part of the bespoke vocabulary, just as brace-top trs or vest lapels are. They look fine if the jacket is otherwise free of fussy details (as here). I’ve seen Prince Charles wearing them on a DB tweed. He’s anything but flash. Bradley – don’t know if you had a look at Mes chausettes rouges’ website yet. If not it’s worth checking out. Beautiful suit, beautiful tie. Beautiful all round that even the superfluous turn-back cuffs doesn’t detract from that. The gauntlet cuffs a spectacular! On the subject of green, what do you think about dark green footwear? I am looking for a Chelsea boot to go with dark red and brown trousers and considering a dark green hatch grain from G&G. I have one pair but I never wear them. Just not that versatile. Would a Mushroom pair of Edward Green suede Dovers be versatile enough? I thought I could pair them with cream Chinos on London’s less cloudy rainy days. You know when that big yellow thing comes out that we sometimes see! Simon, Lovely suit. However, the turn back cuffs remind me too much of The Sound of Music. Winot, green and red? Are you going for the Christmas tree look? Ha! My first choice is grey (hippo or elephant) but that is proving difficult to source. Any tips for shoe colour to go with red trousers gratefully accepted. I think you will have a great leverage for using accessories with this suit! Simon, Would you consider a single breast coat more casual than a double breast coat? Appreciate, the material will play a large part. However, if the material is not of a smooth texture, which would be more casual? Interesting commission Simon, thanks for posting and the honest review. The shade of green is perfectly balanced- an excellent choice. I question the cuffs though – the general cut of the suit is modern and gives you an athletic silhouette. The turnbacks, for me, speak of country attire – functionally, turnbacks guard against fraying via hard wear (Mac observes that they were on HRH’S tweed suit), additionally if the trousers had a turn-up finish then, aesthetically, they would marry up – a small point but I think worthy of mention. The shoes are very fine but to match the less formal look I would have gone for brogues or brown suede. Whilst on this subject I’ve been thinking of a blue suit in flannel (I’m after a softer look than worsted) – not as versatile as green admitedly but alongside grey flannel it would be good for more informal wear – importantly what are your thoughts on the shade of blue? I am not Simon but i’d avoid ‘ a true navy flannel’. It is an odd looking thing and all the virtues of flannel are obscured by navy. Very subtle colour & I don’t mind the trousers at all. 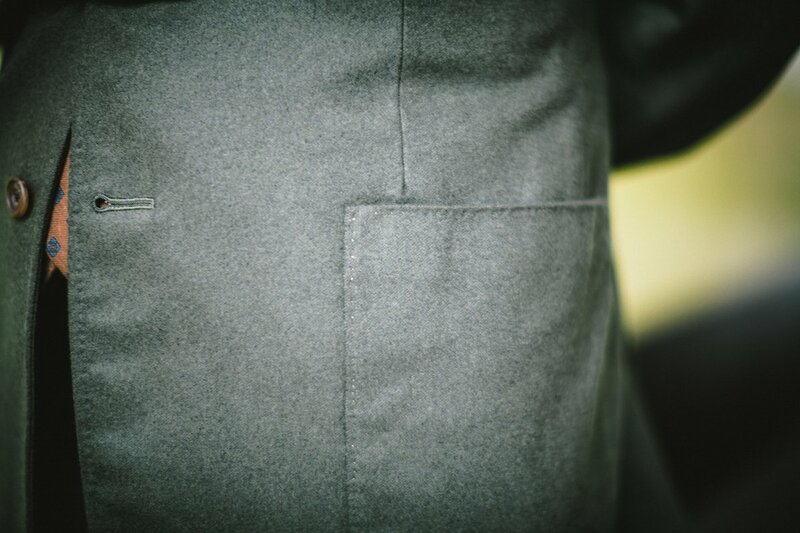 Speaking of trousers when you provide these suit reviews could you possibly provide some more detail/image/thoughts on the trouser component when obviously a lot of the important trouser detail is under the jacket…? Who would you recommend taking bespoke suits to for alterations in London? If the original tailor is unavailable or you simply can’t travel to them – as I suspect may be case with Brian. Is Graham Browne still your favourite? I used Brian Smith and am returning to him shortly. 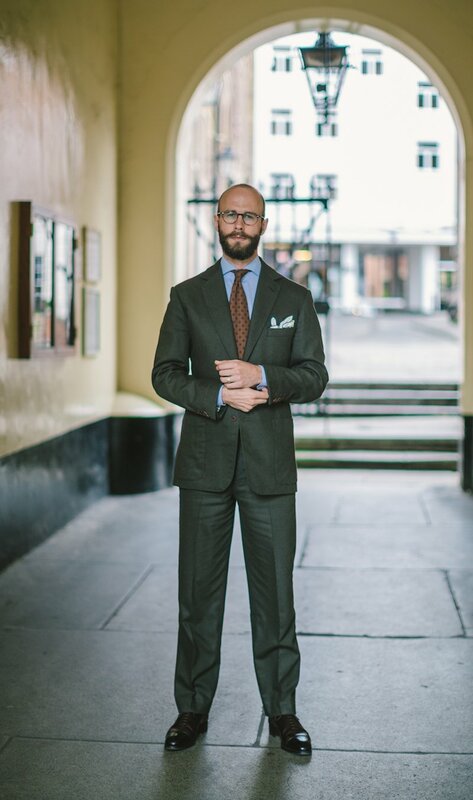 He made me an excellent db suit from London Lounge lovat flannel (500g). The trousers are perfect and the coat has the A & S soft shoulder – my only minor question relates to the grip of the collar at the neck, which I like to be more noticeable. However, the flannel is heavy and soft, so there may be an explanation. Brian seemed perfectly willing to talk about this when I contacted him recently. It seems to me that with a first suit, you do take a risk that it will not be absolute right in every final particular – even if you go to the aristocrats on the Row. That is why it is vital to talk to the artisan about any concerns – at least he can then do something about it! I am surprised that Simon didn’t pick up on some of the issues he mentions at an earlier stage. Unfortunate that the cloth is now discontinued, but for anyone that is interested in replicating the look, Loro Piana offer a very similar cloth in their Wool & Cashmere Flannels bunch, the cloth number is 640055! Hi Simon, I have a question about worsted flannel (10-11oz) trousers. I have a Marling & Evans flannel trousers that make me crazy! ahahahah! They don’t keep the shape and they cling to my socks, a bit like yours in the first pic. Is there something I could do? This doesn’t happen with 13-15oz woolen ones… Is it just a problem related to weight? Would you say Brian Smith is closer to W&S (foreign bespoke) or Graham Browne in terms of level of make? Would you recommend as an entry-level option for someone wanting to try their first drape-cut suit but not quite ready to stretch to A&S or Steven Hitchcock prices?